A new mural adorns the controversial Israeli barrier in the West Bank town of Bethlehem. Painted overnight by the artist Lush-sux, the mural shows Israeli Prime Minister Benjamin Netanyahu and US President Donald Trump kissing. Lush-sux says that the wall is a symbol of the imprisonment of the Palestinian people. 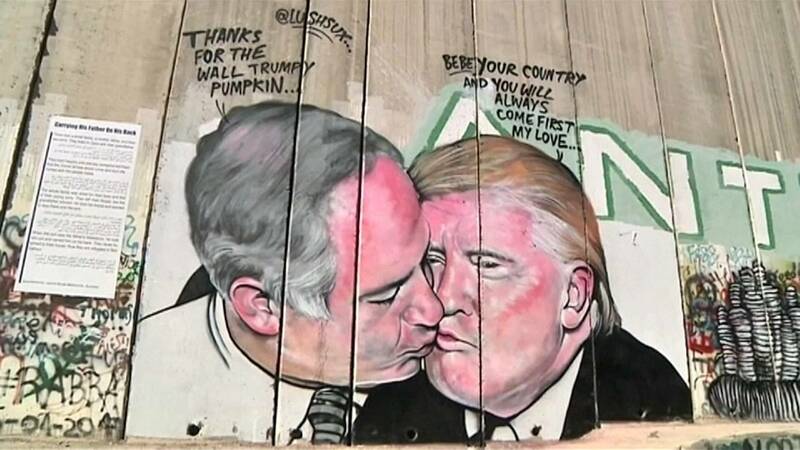 The Trump-Netanyahu kiss appeared at the weekend and is just the latest in a series of political murals painted on the barrier. “We like that there are a lot of paintings on the wall, especially from famous artists like Banksy and Lush. They come and deliver messages on this wall to the world, calling for an end to injustice and persecution for our nation,” said one tourist visiting the mural. The new mural on the West Bank barrier comes as Netanyahu builds an anti-tunnel around the Gaza strip and as Trump advances with his plans for a wall along the US border with Mexico.